Mizoram is situated at a unique cusp in North East India, in terms of both physical and social contexts. It shares its borders with Myanmar and Bangladesh, while cultural influences range from the indigenous to the Western. 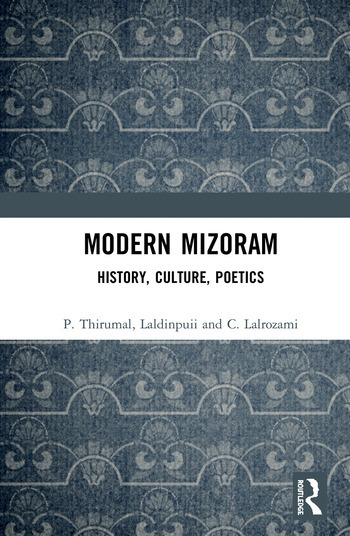 This book offers an alternative understanding of the modern history of Mizoram through an analysis of its cultural practices through language, music, poetry and festivals. It explores the roots of modern cultural works not just in Christianity, but also in precolonial Mizo traditional practices. The authors closely examine text, performance and sculptural images, including the first handwritten newspaper Mizo Chanchin Laisuih (1898) and the Puma Zai festival (1907–11) from the early colonial period along with a contemporary sculptural image. They argue that cultural works open up to new forms of interpretations and responses over time. The book indicates that the Mizo creative sensibility enmeshed in theological, capitalistic-material and political/ideological regimes informs its modern enclosures, be it region, religion or nation. This book will be of great interest to scholars and researchers of cultural studies, literature, media, history, politics, sociology and social anthropology, area studies, North East India studies and South Asian studies. P. Thirumal is Professor at the Department of Communication, S. N. School of Arts & Communication, University of Hyderabad, Telangana, India. His areas of interest and specialization include theory and history of media, histories of technologies and communities, borderland media history and the North East region of India. He has published in The Indian Economic and Social History Review, Seminar and the Economic & Political Weekly and has written for newspapers and periodicals. Laldinpuii teaches English at Government Aizawl West College, Mizoram, India. She was awarded a PhD at the Department of English, University of Hyderabad in 2017. Her thesis dealt with the formation of identities through Mizo and Khasi folktales. She has presented papers in national and international seminars and conferences and has contributed articles to journals. C. Lalrozami is Programme Coordinator at the Directorate of State Council for Educational Research and Training, Aizawl, Mizoram, India. She has presented papers in several conferences and seminars and contributed articles in books and local magazines. She has prepared a number of documentary films and educational television programmes which have been broadcast in national channels such as Doordarshan Kendra and the regional channels.